Our service department is one of the best in the business. We are always ready to respond with prompt professional and most importantly, highly skilled and certified service technicians. We have extensive industry knowledge and competency that ensures that your service, ac repair or maintenance will be done right the first time - guaranteed. We have one of the highest customer satisfaction ratings in the industry, over 98%, and we take pride and care in preserving this approval rating. Our fleet of service vehicles are fully stocked and ready to respond with fast service. 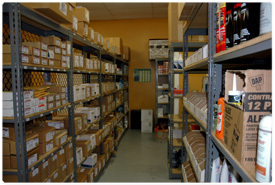 We're often able to get your system working again within hours because we maintain such an extensive parts inventory. No matter what brand your home has, we can find the cause and fix it. 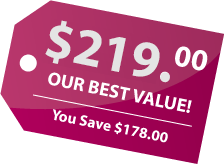 We also use a flat rate pricing system, so you know the total cost right up front. You don't have to watch the clock and wonder what the total might be. We offer a full 1 year Parts and Labor warranty on any repair we make for your peace of mind. If you find yourself faced with a decision to repair or replace your system, Burgess Heating & Air will guide you with the information you need to make a sound HVAC decision for your home comfort needs. Not only does routine maintenance pay for itself by maintaining efficient operation and helping to prevent future repair costs, it also can add several years to the life of your heating and air conditioning system. It is also important to remember that most manufacturers require routine maintenance in order to validate the warranty. For homeowners wishing to maximize comfort and insure that their system is performing efficiently, it is important to have your heating and cooling system serviced at least one a year, optimally twice is best. We offer two different maintenance plans. Includes all Basic Service points PLUS indoor and outdoor coil cleaning, 8 oz. commercial grade odor eliminator, isolation pads for outdoor unit (prevents mildew build up, reduces noise and vibration, wax outdoor unit (maintains appearance and prevents fading of paint). In addition, level 10 customers receive 10% off all service repairs for 12 months & never pay overtime or holiday rates. 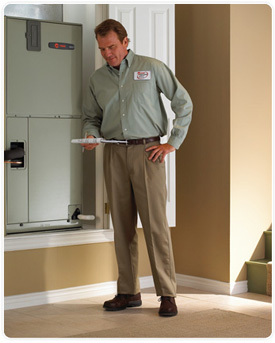 Indoor Air Handler, Electric or Gas Furnace - Blower motor, housing and wheel, evaporator coil, heat strips, control relays, electrical connections and voltage, condensate drain line, safety devices, thermostat and filters. Outdoor Unit or Heat Pump – Compressor, condensing coil, fan motor, contactor, defrost controls, reversing valve, electrical connections and voltage, freon level, safety devices and complete system functionality.